New results on ripple formation on polymer, coming from a theoretical and experimental collaboration between Laboratorio NEST of Scuola Normale Superiore, IMDEA in Madrid, Istituto Nazionale di Ottica of Consiglio Nazionale delle Ricerche in Pisa and Université Libre de Bruxelles were published on New Journal of Physics. When the shear stress on a compliant surface exceeds the yield strength of the material, a periodic wrinkle pattern is often observed. This phenomenon has been also recognized at the nanometer scale on polymers, metals, ionic crystals and semiconductors. In those cases, the mechanical stress can be efficiently provided by a sharp indenter elastically driven at constant velocity along the surface. 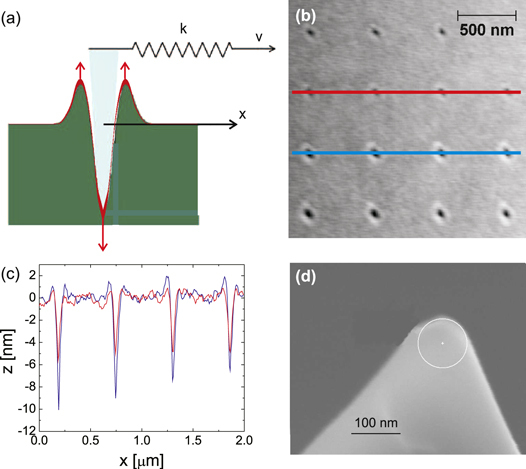 In the published paper Authors suggest that the formation of such surface ripples can be explained by the competition between the driving spring force and the plastic response of the substrate. In particular, they show how the ripples are expected to disappear when the indentation rate is below a critical value or, alternatively, when the sliding velocity or the lateral stiffness of the contact are too high. The model results are compared to atomic force microscopy experiments on a solvent-enriched polystyrene surface, where the rippling formation is enhanced at room temperature, compared to bulk melts. A similar approach could be employed to describe rippling phenomena on larger scales. To see a video presentation of this paper click here.